On March 21, Twitter turned 3 years old. (That also happens to be the first full day of spring.) 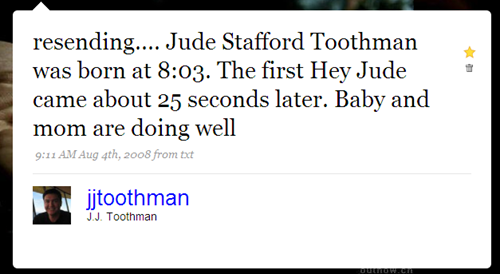 So I decided to dig into my Twitter archives to find my most significant tweets since my very first one on May 17, 2007. You can see my first 16 tweets using the very cool My Tweet 16 service. The other big Tweets in my past are from the day Jude was born. Going thru the Twitter archives to dig these up wasn’t as easy as I thought it would be. So moving forward, I’ll be using Twitter favorites to mark the big Tweets from my timeline. Happy birthday Twitter. You’re maturing quite nicely.